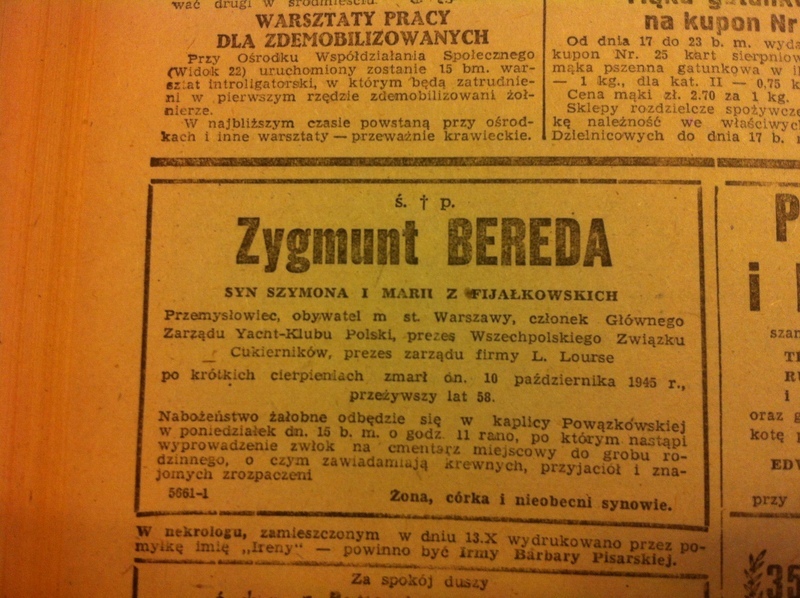 Though not specifically related to Jewish heritage (since he was Catholic), here is the death notice of Zygmunt Bereda, my grandmother’s second husband and the stepfather with whom my mother grew up. I found a reference to it online, and then tracked down the issue of the newspaper at the library of Adam Mickiewicz University. After brief suffering died on 10 October 1945 at the age of 58 years. His wife, daughter, and two absent sons inform family and friends that the funeral service will be at the Powązki chapel on Monday the 15th at 11 in the morning, after which the body will be put to rest in the family grave. I can only imagine what it must have been like to survive the war only to die months later like that. According to his death certificate, he died of a heart attack. My grandmother would have been 51. Their home and businesses were destroyed, and shortly thereafter, the postwar government nationalized what little of value remained. I’ve been told that even then my mom did not want to leave Poland. She was emotionally fragile after all that had happened in the war, and also she did not want to desert her fatherland. As it became obvious that Poland would not be free, and that prewar elite and Home Army soldiers would be persecuted in the communist system, she finally relented. She and my grandmother joined my uncles in England at the end of 1946.